Gosh you guys, I am doing my best to soak up every ounce of summer weather this year. How about you? Last week was the Summer Solstice, marking the official start to summer and the longest day of the year. 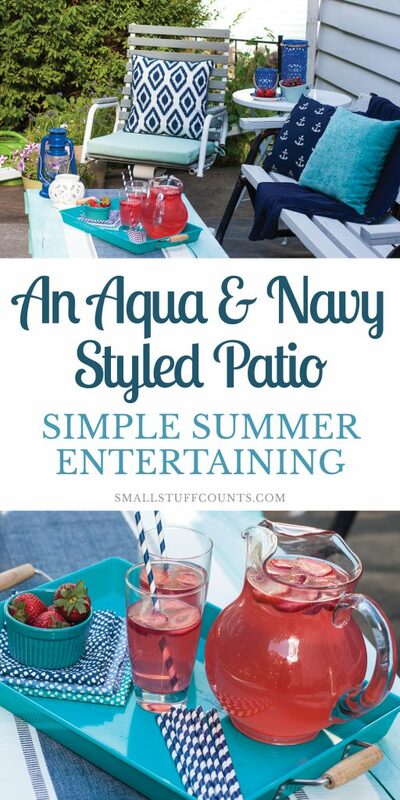 These long summer nights are meant for summer entertaining and relaxing on the patio with family and friends! 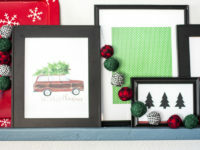 Thank you to Wayfair for sponsoring this post! See my disclosures for more information. 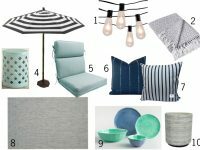 Although we still have several projects to finish before our front patio makeover is officially complete, I couldn’t resist styling the space a bit the other day. I’ve been busy working on curb appeal projects lately and was starting to feel like the patio was never going to come together. 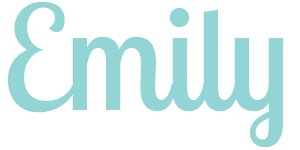 One project always seems to lead to another, and sometimes it’s helpful to take a breather and put a space back together as-is so you can see how much progress you’ve made. I spent a day hustling to finish the furniture projects I’ve been working on so I could set up a little seating area on the patio. 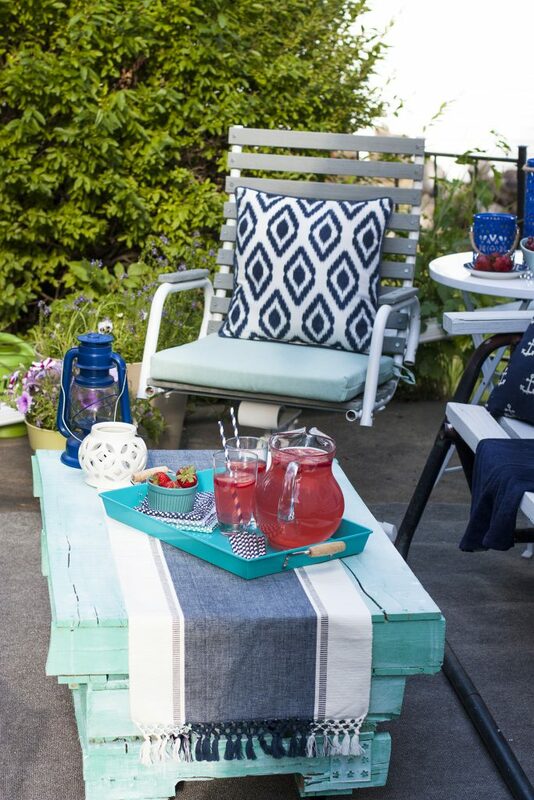 With my grandmother’s bench swing repainted, two thrifted chairs refinished and a pallet coffee table built, I was able to furnish and style the patio so we can enjoy it on these long summer nights and do some summer entertaining. The concrete slab still needs to be patched and painted, so I rolled out an outdoor rug to cover up the cracked concrete for now. 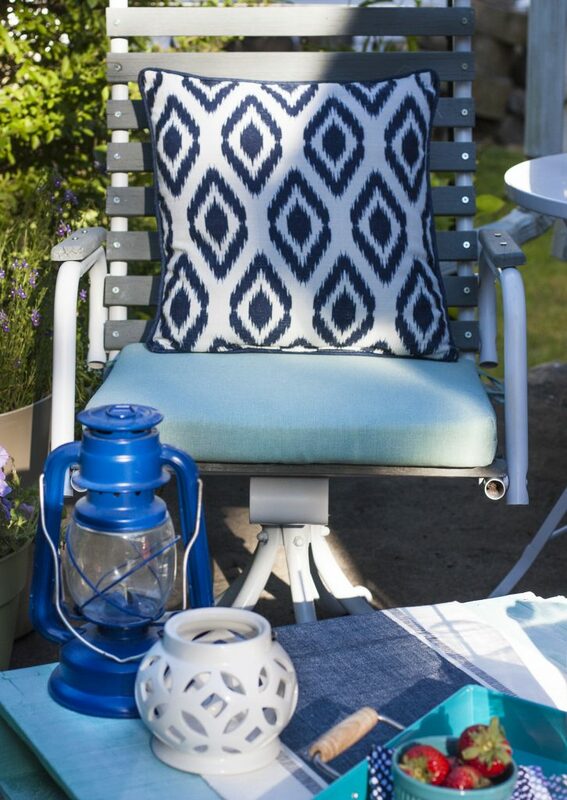 An outdoor rug instantly makes this space feel cozier! I’m barefoot any chance I get in the summer, so a soft rug underfoot feels amazing. 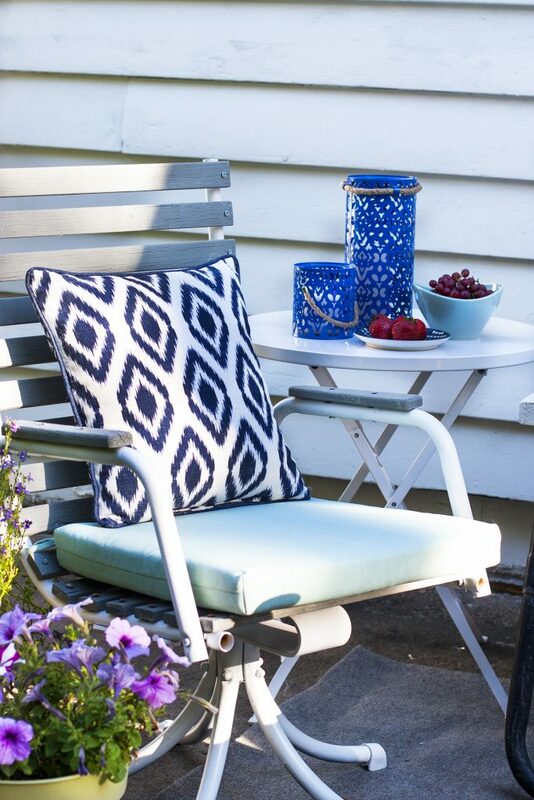 Adding cushions, a throw blanket and pillows to the seating adds instant style to the patio with little effort. 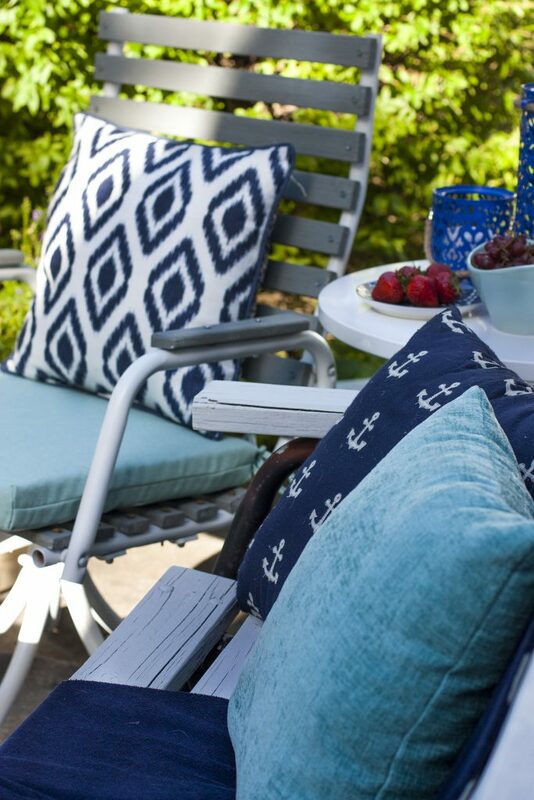 I haven’t purchased any outdoor pillows for our patio quite yet, so I grabbed a few from our living room for now. They aren’t intended for outdoor use, but it’s easy enough to bring them inside at night. 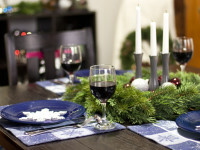 I decorated the tables with a few lanterns to add ambiance. We love sitting out here in the evenings, and a flicker of candlelight adds a feeling of romance and luxury. I could honestly sit out here for hours and breath in the fresh air of summer. 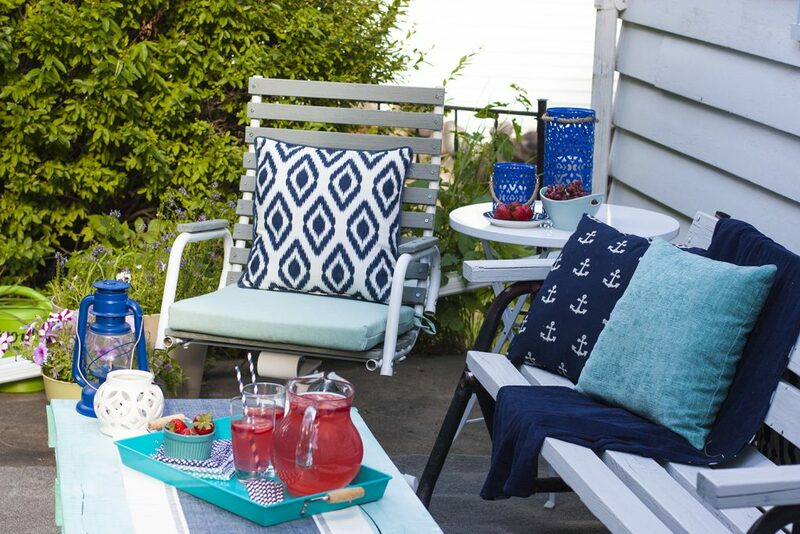 The patio is my favorite place to enjoy good conversation or a good book on these long summer evenings. 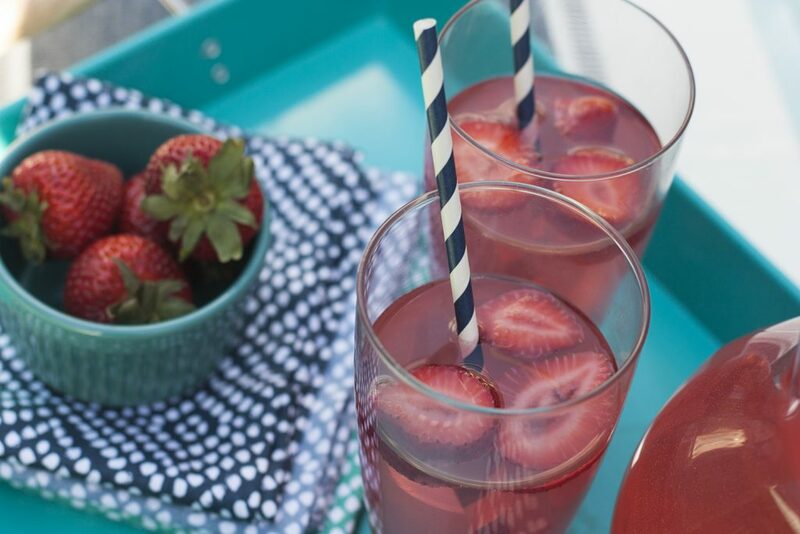 Lemonade and strawberries are two things that mark summer to me, so a cold glass of strawberry lemonade and fresh fruit feel like perfect refreshments to serve on the patio. 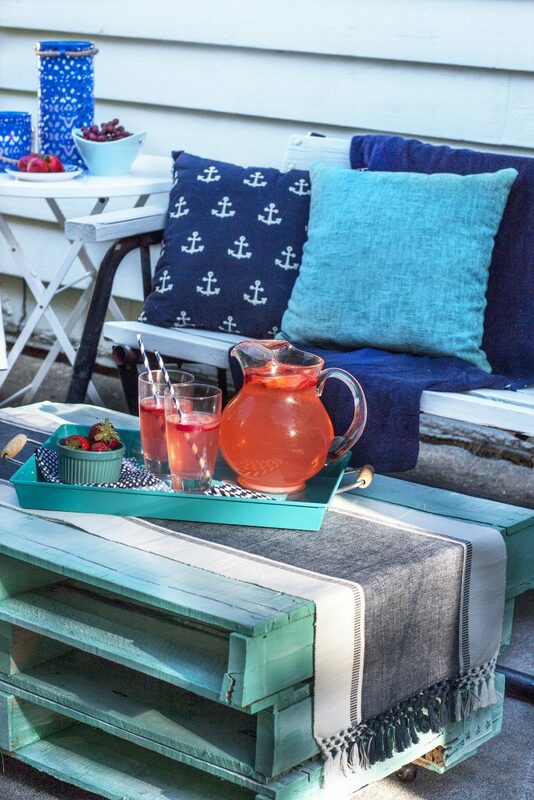 Summer is a time to slow down and keep things simple, and bringing out a serving tray of lemonade and strawberries feels special yet laidback. 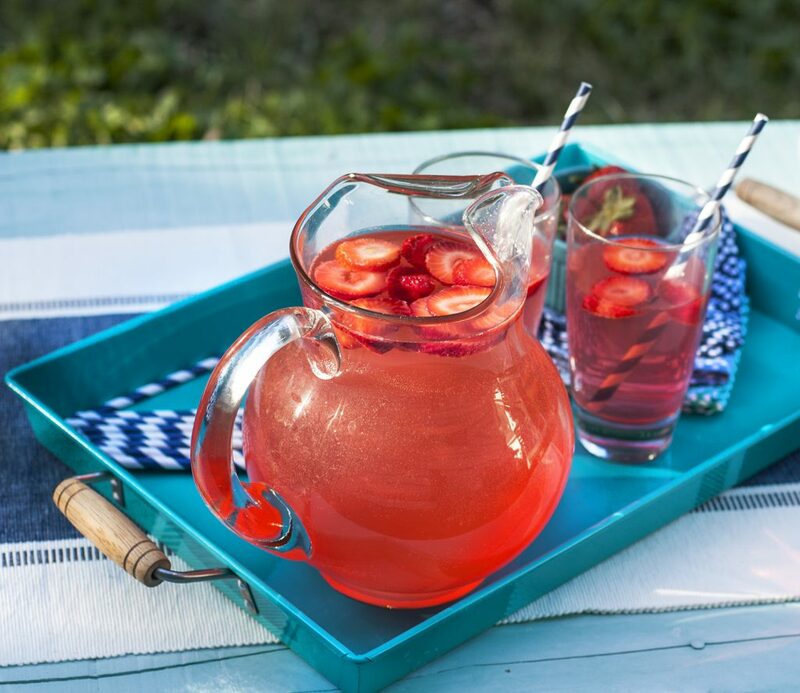 It only takes a minute to mix up a pitcher of lemonade, and adding a bit of fresh fruit is the perfect way to top it off. 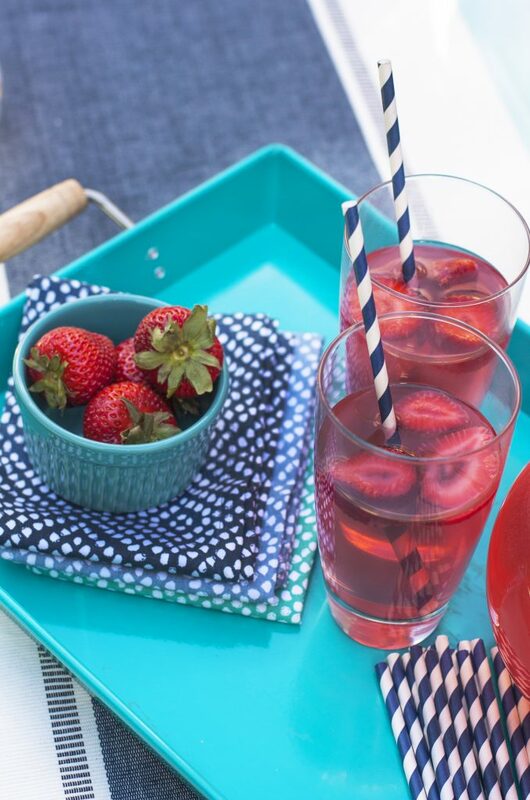 I also think cute paper straws are a carefree way to dress up even the most basic drink. This is our third summer in this house, and I’m so happy that this patio is finally a place where I can relax and enjoy these summer nights. I’ve been spending a ton of time out here and love it when David joins me to sip cold drinks, talk and take in the Iowa summer. 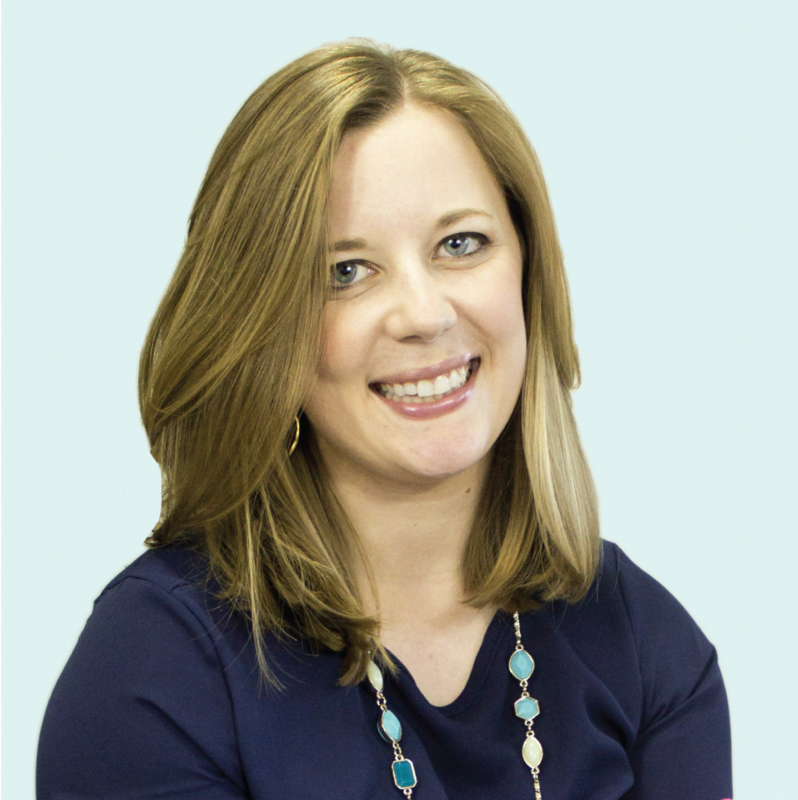 If you have a project that seems to never end, I encourage you to take a moment to put it back together as best you can so you can enjoy it for a little while. After a few warm nights relaxing on the patio, I feel refreshed and eager to get back to my list of projects! 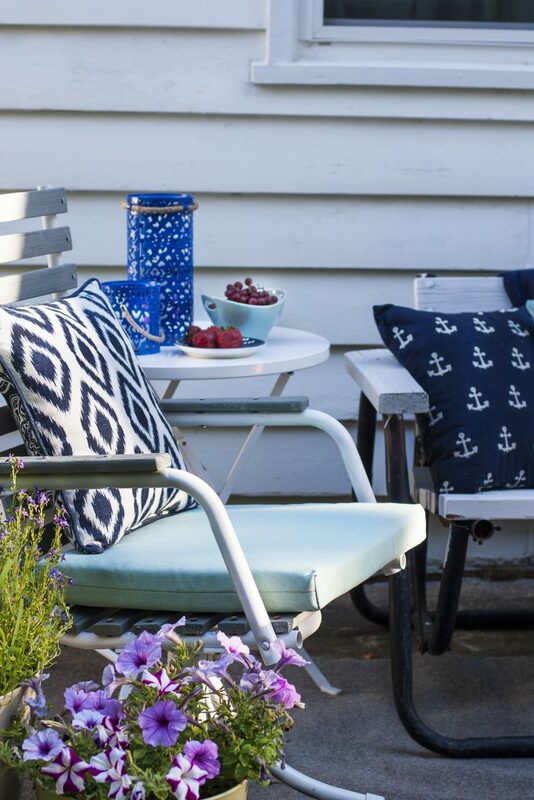 It feels amazing to enjoy the progress I’ve made on our patio makeover, and now I’m excited to get back to work so I can officially wrap things up with plenty of warm weather left for summer entertaining. I’m looking forward to plenty of evenings relaxing out here with family and friends. 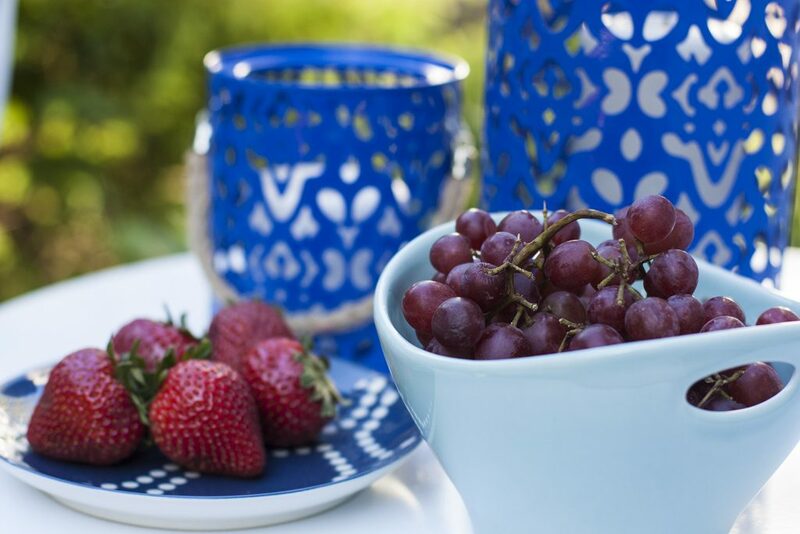 Ready to do some summer entertaining at your house?